This Australian magazine is colourful and jam-packed with flowers and planting ideas. There are a lot of brightly colourful advertisements too. Some great Aussie characters write regular articles for ABC Australian Gardening. All the various climatic areas are well described, too. I'm envious of many of the Australian garden climates, but it's surely a case of 'the grass is greener'- I'm just suffering from tomato-envy. There's a TV show which goes with this magazine, too. 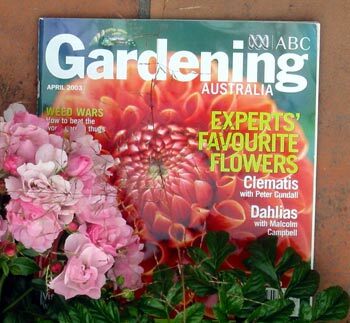 From looking at the magazine I'll bet that the ABC's Gardening Australia TV programme is great fun to watch.